A wooden honour roll commemorates the soldiers who returned from World War One. It lists 42 names. The unveiling of an honour board of members of St Luke's Church, Campbell Town, who enlisted during the late war, took place on Sunday last. There was a large attendance, and the Rev. Edward Gordon occupied the pulpit and delivered a stirring address from Judges V., taking as his text the words, "Praise ye the Lord, when the people willingly offer themselves "
The unveiling ceremony was performed by Lieut -Colonel Henry Foster, assisted by a number of returned soldiers, who dedicated it to the glory of God, and in honour of those members of the church who obeyed their country's call and returned home safely. 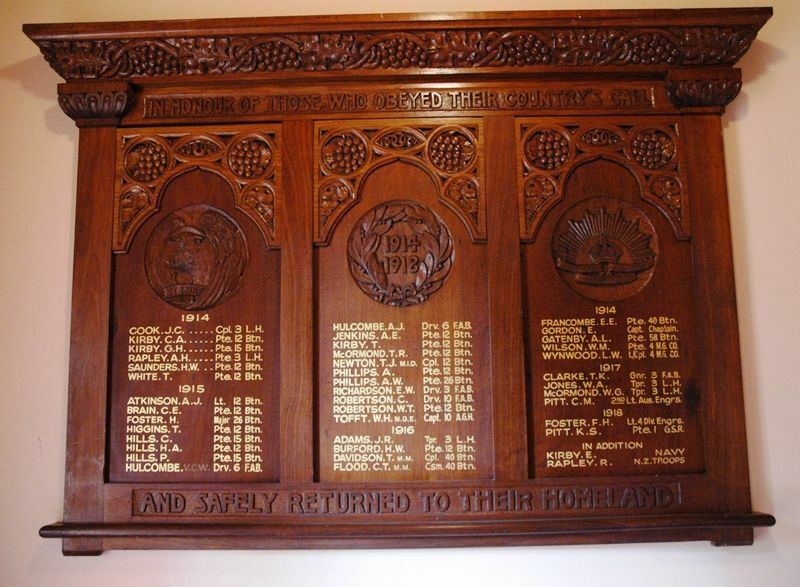 The honour board is a very handsome piece of work, being of Tasmanian blackwood, elaborately carved, the carving being done by Mrs Payne. The money was subscribed by the congregation of St Luke's. The Mercury (Hobart) 18th April 1923.
and safely returned to their homeland.